We have discussed about Atul Auto a couple of times and to go in-depth and get a much better understanding of the company, we interacted with Mr. J V Adhia, Vice President, Finance – Atul Auto. The company seems to be in a sweet spot with a very comfortable balance sheet and a good opportunity to maintain growth rate of about 25-30% for at least next couple of years. The co has been a leader in its existing territory – Gujarat (approx. 45% market share) & Rajasthan (approx. 30% market share), the company is now trying to go Pan India by entering new territories. During the period 2001-06 the company had been growing at about 70% p.a. Till then we were a front-engine 3-wheeler company. In 2007 we decided to go pan India and introduced the more predominant rear-engine 3-wheeler segment. Some things went wrong and the company faced a rough patch, and that is the reason you notice stagnant sales for the period 2007-10. However in June 2009 period we introduced Atul Gem the rear-engine vehicle and it has been received very well in the market. The growth is back on track. Overall about 91% of the total autos are rear-engine vehicles. We are No #1 in Gujarat with about 44% market share & No #2 in Rajasthan with about 30% market share. Kerala & Assam are our next big markets. We are gradually entering new territories and ramping up dealer network. Current dealer network is about 120 dealers. A year back we had 100 dealers but only 30-40% were active! Now more than 80% are active. Plan to have 140-150 dealers by this year end and 250 in 2 years. We are in process of doubling our capacity from 24,000 to 48,000 vehicles p.a. This expansion is being done at our existing plant and we have sufficient space. We are expanding capacities by ongoing de-bottlenecking exercises. We are already at 20-25% higher production and the rest of the de-bottlenecking increases should happen over next 3-6 months. We have options of introducing a double shift, as and when deemed necessary. We discussed Indag Rubber recently and the stock has done quite well in a challenging environment. Indag as a brand has got fairly established. A certain segment of quality conscious customers do ask for Indag brand. Our quality has stood out over the years. For example we are the only retreader who can collect advance payment from some State Transport Units (STU) like the UP STU. We have introduced newer materials and more effective tread patterns that have started paying off in the last couple of years. We have started growing at a much faster pace now. If a new CV tyre costs Rs. 18000 then retreads usually sell at 4500-4800 range and a good retread runs approx. 80-85% of a new tyre. Hence it’s a logical cost saving proposition and the business will continue growing. Roughly 40% of tyres come for retreading at the end of useful life. Demand is robust, we have not seen any slowdown in demand of retreads. One of the key take away from the meet is that the company is being professionally managed and management is quite conscious on the quality of earnings rather than just growth. Company maintains strict control on debtors and inventories and hence it has good free cash flows. Company is confident of maintaining the volume growth seen in first two quarters of FY 2012 and we expect an EPS of Rs.30-35 for current year. Please check out the complete management interview (requires free login). 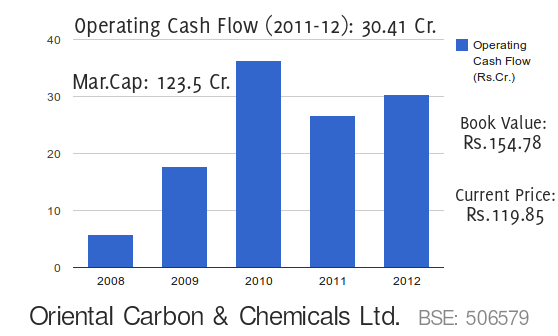 The co seems to be on track to continue its spectacular track record of growing at a CAGR of 29% for last 13 years. Their target of $ 1 Bln turnover and 10% market share seems quite achievable. For FY 12, BKT may be able to do a 25-30% growth resulting into a turnover of 2500-2700 Cr. There were concerns on the growing competition and we asked the management about the same. It seems the market is big enough for 2-3 players to operate like BKT and take away the market share from biggies. Other players will take quite some time to catch up. So if the company is able to do a turnover of about 2500 Cr with 18.5% OPM, it may post a NP of about 240 Cr, resulting into an EPS of about 25 for FY 2012. CMP of 156 discounts it by just 6.5 times. We feel that as BKT is entering the big league and making its presence felt in the global OTR space, the stock deserves a re-rating also. It would be tough to find companies having a consistent growth of about 30% for last 13 years with good margins, ROCE etc available in single digit PE multiples. We had recently posted about Astral Polytechnik Ltd. (APL). We had discussed about the shift taking place in the Indian plumbing market from GI Pipes to CPVC and Astral’s leadership position in the same. The feedback and further research on this stock has been remarkable. We see us growing at 30-35% CAGR for the next few years. If we execute well, a Rs. 1000 Cr turnover is achievable within the next 3 years. We are looking to expand to 70,000 MT by this year end. The availability of the CPVC compound (other than Lubrizol) is a key constraint. Please check out the complete report (requires free login) to get a in-depth understanding of the company and the potential ahead. The opportunity for the CPVC players is huge as the acceptance and usage of CPVC is increasing fast in the plumbing industry. […] You see negative Free Cash Flows, but that’s not a bad thing for a company in its early growth stages. It is investing all the profits it generates and more back into business expansion. As you can see even the much bigger global majors report marginal or negative free cash flows in this industry. And when we look at its track record, it makes us feel even better. Although achieved on a small base, it has more than tripled its sales in last 5 years while earnings per share (EPS) has gone up 8x (on an adjusted basis) in the same period. Just look at the long term track record, it tells us this Management is managing growth nicely. Makes me wonder about the quality of this growth. How has it managed profitability and returns in the pursuit of this growth? Its heartening to see that margins have consistently been trending up. Returns shot up tremendously in FY07 on the back of high capacity utilisations. Since FY07 Manjushree has been investing in this growth aggressively by doubling capex every year. This has led to lower capacity utilisations and Asset turns, in turn lowering RoA and RoE. But on the whole returns have also been trending up. You can read the complete in depth analysis done by us jointly at Stock Pick Focus. You might also like 10 Questions to Manjushree Technopack Management.